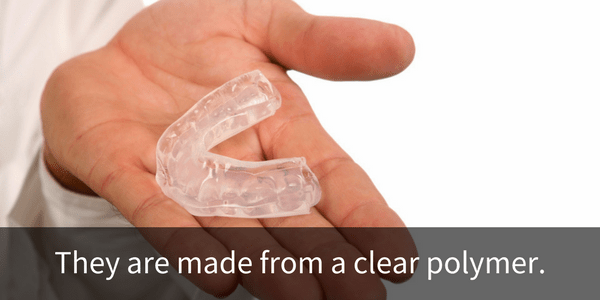 Invisalign - You'll Love These Clear Braces! Have you been wanting to straighten your teeth but the thought of having to deal with metal braces keeps holding you back? For years, metal braces were the only way to get a beautifully aligned smile, but they had many drawbacks. They make eating unpleasant, are difficult to keep clean, and are just unsightly! The good news is that TLC Dentistry offers a modern-day alternative to this traditional approach that removes all of those drawbacks – Invisalign®. Invislign® uses a system of computer designed and custom created aligner trays that gradually move your teeth into their ideal position. There are many advantages to this system, here are a few we think will win you over to clear aligners. The smoothly molded trays fit comfortably around your teeth and won’t cut or irritate the sensitive tissues found in your mouth. Because the aligners are removable, you can brush and floss your teeth as you normally would. No frustration of trying to clean around each metal bracket in traditional braces. 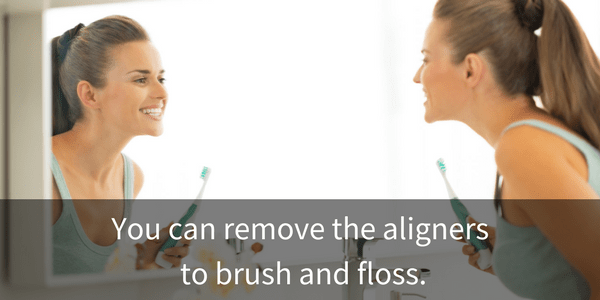 The aligner itself is easy to clean which helps to protect against any bacteria build-up. This is an incredible advantage for those who have metal allergies. You can finally straighten your teeth without the added distress of allergic reactions. Invislign®wearerss love this advantage. Since you can remove your aligner to eat you can still enjoy all your favorite foods, unlike with traditional braces. 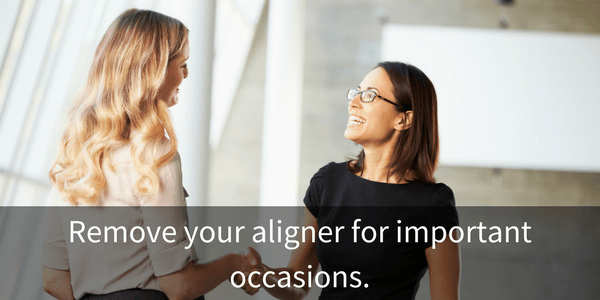 School photos, proms, important business presentations can all be enjoyed aligner free. Beyond the pleasure of having a beautiful smile, Invislign® also helps your teeth stay healthy. Crowded and crooked teeth are hard to clean and are excellent places for disease-causing bacteria to live. This bacteria has been linked to other harmful conditions in the body. So, straightening your teeth will actually be good for your whole body. If you want to straighten your teeth fast, comfortably, and with the minimum of fuss and bother, Invisalign® invisible aligners is the way to go! Call us today at 831-757-1038 for an Invisalign consultation or make your appointment online.